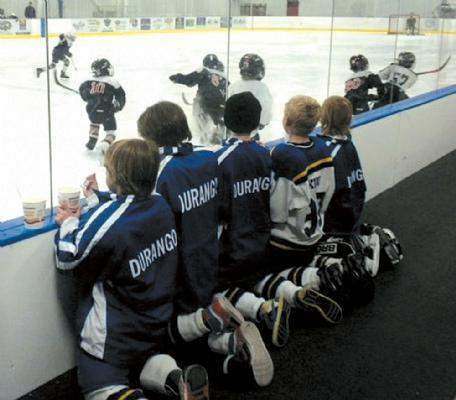 Members of the 6- to 8-year-old Durango Mites (23-0) youth hockey team, from left to right, Joe Arnwine, Alexander Sakadinsky, Cullen Robinette, Gus Kidd and Jax Bayer, snack and scout the Gunnison and Telluride hockey teams during a tournament Feb. 13-14 in Gunnison. Durango, a member of the Durango Area Youth Hockey Association, took the first game, played on Gunnison's outdoor rink,6-3. Goaltender Dane Bier stopped 18 of 21 shots to earn the win. Durango held a 4-2 lead after two periods behind second-period goals from Colin MacKay and Cory Kerns. three goals of the contest. to qualify for the league semifinals, which will be held in Durango. 14-0 in Game 3 before again dispatching Crested Butte 5-2. The Mites capped off the weekend with another rout of Gunnison in the championship game, winning 8-1.
between periods of the Colorado Avalanche-Calgary Flames game at the Pepsi Center on April 2.